December started out for me on the 16th. This does not a good month of cooking/baking make. I mean it is December after all, but sometimes after Thanksgiving, you just do the best that you can do. Sad, but true. That and my dishwasher died – serious impediment to doing anything in the kitchen. It is surprising how much so. Butter = 83.3 Tbs = 10.4125 sticks – 41.65 ozs – 2.603 pounds. Eggs = 2 +2 +2 +6 – math is involved. = 12 large eggs. These are strangely Christmas cookies for me. We probably had them other times, but in my head, they will always be Christmas cookies. I do remember when there were tan M & M’s. Damn blue things – ugh. Yes, I’m showing my age once again. Sigh. 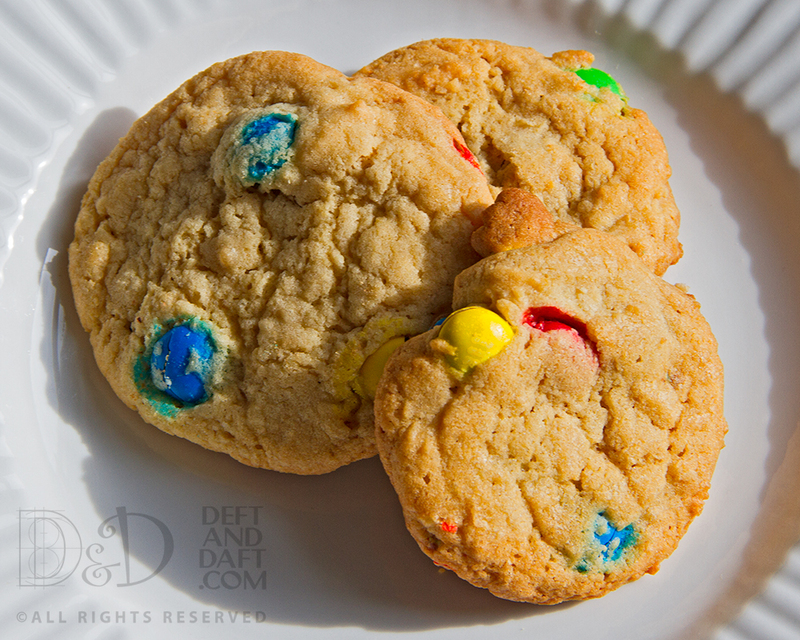 Nevertheless, M & M cookies are only slightly amazing. The dough is not too sweet, but has a good bit of brown sugar that makes them slightly chewy and lovely. They do remind me of my mom. And the Boy loves them any time. So I made them for his trip to Bonnaroo music festival. I really don’t want him to go so far, but … yep being the “mom” again. Although, I have to admit I’m jealous of all the bands he’s going to see. Dang it. I like these cookies because there is no thawing butter. You just use vegetable shortening – Crisco for lack of a better word. It’s kind of funny that I never had my Mom’s recipe and it took a good bit of work to find the one that was pretty much perfect – even on the interweb. I’m guessing when I go see my dad that I’m going to have to sort about and look for recipes. I think the one thing I want – recipe wise – is the yellow cake with the fudge frosting. If I could do that just once, I would be happy. It was the cake that we all enjoyed. Dale liked it for his birthday. But for mine – it was always Pecan Pie. Preheat oven to 350 degrees. Cream together Crisco and both sugars. Add eggs, one at a time, and mix to combine. Add vanilla. In a bowl, sift together flour, baking soda, and salt. Add flour mixture to butter mixture in 2 batches, scraping down the mixing bowl as needed. Add M & M’s and stir to combine. Spoon onto parchment-lined baking sheet and bake 10 minutes or until golden.